All 6’s and 7’s – The Tour is coming to a city near you! We’re laying out the locales on the tour one by one, hoping fans from each city will come out to represent their town so visiting fans know what they’re getting into. The 24th city on the tour is Boise, Idaho. 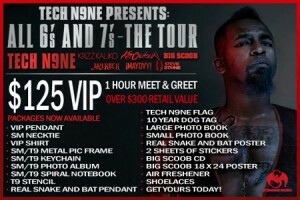 Tech N9ne and Strange company ¡Mayday!, Stevie Stone, Jay Rock, Krizz Kaliko, Kutt Calhoun, and Big Scoob will perform at the Knitting Factory on June 24, 2011. We had fans from Boise call in and represent along with the Techn9cians in Redway, Sacremento and Bend. Listen below to hear what they had to say! All 6’s and 7’s – The Tour as it runs through Boise on June 24, 2011. Also remember to reserve your VIP Packages for the show, which includes exclusive merchandise and a Meet and Greet with Tech and your favorite Strange Music artists. They’re running out quick so it’s best to get them while you still can! 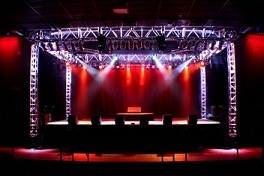 The Knitting Factory on June 24, 2011, see you there! The All 6’s And 7’s Tour continued its stunning track record with another sold out show at the Knitting Factory in Boise, ID on June 24. No one was more excited to be a part of the night than the Strange Music fans, who were looking forward to brand new sets from Stevie Stone, iMayday!, Jay Rock, Kutt Calhoun, and Krizz Kaliko. The packed crowd was also treated to a completely new stage set from Tech N9ne that saw him perform hits like “The Ring”, “Welcome To The Midwest”, and “Riot Maker”. Marked as another successful night, the Strange Music crew packed up and headed out to Magna, UT for more madness. Watch this video taken in the parking lot of the Knitting Factory in Boise! Check out this video of the Meet and Greet!